With the Honeywell Voyager 1450g you are equipped for the future. 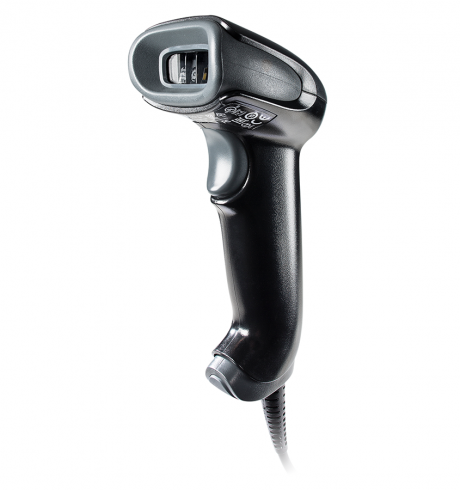 The basic version of the corded imager is designed for processing 1D barcodes. Due to the flexible licensing system the scanner may be upgraded at any time afterwards to become a fully-fledged area imager. It additionally serves for the capture of PDF and 2D barcodes. This reduces acquisition costs while at the same time makes the future changeover easier, in case the requirements profile changes. A large variety of available interfaces ensure for smooth integration (USB, keyboard wedge, RS232, IBM). Featuring IP40 certification, the scanner is well protected against the ingress of foreign particles larger than 1 mm. At the same time it withstands drops from heights up to 1.5 m. Its low weight of 130 g and manageable dimensions of 62 x 169 x 82 mm (L x W x H) make the scanner easy to carry. A 5-year manufacturer’s warranty additionally secures your investment and speaks for the longevity of the product.